In this pulse-pounding thriller from the author of the “haunting, twisting thrill ride” (Megan Miranda, New York Times bestselling author) The River at Night, a young woman leaves behind everything she knows to take on the Bolivian jungle, but her excursion abroad quickly turns into a fight for her life. Lily Bushwold thought she’d found the antidote to endless foster care and group homes: a teaching job in Cochabamba, Bolivia. As soon as she could steal enough cash for the plane, she was on it. When the gig falls through and Lily stays in Bolivia, she finds bonding with other broke, rudderless girls at the local hostel isn’t the life she wants either. Tired of hustling and already world-weary, crazy love finds her in the form she least expected: Omar, a savvy, handsome local man who’d abandoned his life as a hunter in Ayachero—a remote jungle village—to try his hand at city life. When Omar learns that a jaguar has killed his four-year-old nephew in Ayachero, he gives Lily a choice: Stay alone in the unforgiving city, or travel to the last in a string of ever-more-isolated river towns in the jungles of Bolivia. Thirty-foot anaconda? Puppy-sized spiders? Vengeful shamans with unspeakable powers? Love-struck Lily is oblivious. She follows Omar to this ruthless new world of lawless poachers, bullheaded missionaries, and desperate indigenous tribes driven to the brink of extinction. To survive, Lily must navigate the jungle--its wonders as well as its terrors—using only her wits and resilience. 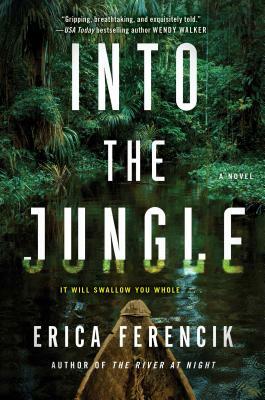 Primal, gripping, and terrifying, Into the Jungle features Erica Ferencik’s signature “visceral, white-knuckle” (Entertainment Weekly) prose that will sink its fangs into you and not let go. Erica Ferencik is a graduate of the MFA program in Creative Writing at Boston University. Her work has appeared in Salon and The Boston Globe, as well as on National Public Radio. Find out more on her website EricaFerencik.com and follow her on Twitter @EricaFerencik. She is the author of The River at Night and Into the Jungle. “Relentless and frightening, Into the Jungle hurtles us down a treacherous river of piranhas and poisonous snakes into the strange, terrifying Bolivian jungle. A hypnotic, violent, unsparing portrayal of a naïve young American woman’s torturous coming-of-age in the unforgiving Amazon wilderness. A nail-biter." "Gripping, breathtaking, and exquisitely told – Into The Jungle pulls you into another world, returning you forever transformed." "Wild and ferocious and incredibly brave! The talented Erica Ferencik ventures into the deepest recesses of passion, fear, and primal survival. This tale of resilience and power will haunt and inspire you— and sometimes terrify you. A complete tour de force and rivetingly compelling, this dark adventure reveals the astonishing risks people take for love." "Take a deep breath - Into the Jungle is a vivid plunge into a wondrous and eerie world. Gorgeously written, richly atmospheric, and absolutely enthralling." "A compelling read. The author pulls you into her narrator's gorgeous but ominous world. You can't stop reading until you have finished the last page long after everyone else's lights are out." "Lush, arresting, and uniquely terrifying, Into the Jungle is an unforgettable story of love and survival set in a Bolivian jungle so vividly rendered that you can practically hear the howler monkeys." "I was lured in, caught off guard, and ensnared by Lily and Omar, their love story, and their journey deep into the pulsing heart of Bolivia and the Amazon. The menacing pace and ripe, dripping prose made every brush with danger—the two-, four-, six-, and eight-legged variety; the whispering, biting, slithering kind—that much more enthralling. I spent hours balled up and tense, hunched over every word, deliciously creeped out, and finally out for blood. Stay alert: You won’t want to miss one thrilling detail of Into The Jungle." "Absolutely intense! Into the Jungle plunges the reader deep into the heart of the Amazon in an adventure as lush and layered as the foliage itself. An extraordinary book with an unusual love story at its center, you'll be on the edge of your seat until the very last word." "Riveting, real, and drenched in adventure and magic, Into the Jungle transports the reader to a wet, lush world of jaguars and anacondas, shamans and poachers, terror and wonder. The action is non-stop, the characters unforgettable, and Erica Ferencik's prose dazzles. I couldn't put it down!" "From page one, I was completely under the spell of Erica's prose. Her protagonist, Lily, is instantly compelling--tough, wounded, brave, terrified, lost, and--once she enters the jungle--found, to her surprise. Like the jungle of the title, the moment you step into Erica's novel, it closes around you and demands that you pay attention. I feel lucky to be among the very first readers of Into the Jungle, and I can't wait to sing its praises to anyone who will listen!" "There is magic in these pages. Ferencik takes you on an intense journey deep into the Bolivian jungle in a thrilling saga full of vibrant, memorable characters and electrifies you with the nerve-jangling challenges they face. You will smell the creeping moss and feel the eyes of the jungle upon you. Transformative and vivid." "At its heart this is a love story between Lily and Omar whose unlikely bond lasts through terrifying obstacles and life-threatening challenges in the blistering heat of the Bolivian jungle. The magic and menace of the Amazon is brought to life by Erica Ferencik’s lush prose as Lily fights gargantuan spiders, screeching howler monkeys, killer pigs, and her own past demons in an alien atmosphere. But this novel also skillfully reveals how the collision of poachers with the inhabitants of a complex ecosystem endangers the way of life and livelihoods of native communities. Gripping, riveting, and absolutely heart-racing, Into the Jungle demonstrates love’s endurance and its ability to build strength and astonishing resilience." "Under the spell of Ferencik’s stunning powers of description, you’ll find yourself outfitting your reading nook with mosquito netting and a machete. This portrait of female strength and guile in the face of the unfamiliar, the exhilarating, and the dangerous is utterly convincing. Like all great adventure stories, it’s about making a home in a beautiful, bewildering, and sometimes hostile world. A thrilling novel." "Into the Jungle nails with great verve the rigors and joy of travel into the uncharted depths of South America's rainforest and the spiritual lives of its people. Erica Ferencik has written a gem of a book. I couldn't put it down." "Packed with excitement and adventure, this is a riveting tale of a true life adventure in the steaming jungles of the Amazon. You won't be able to turn the pages fast enough." "The River at Night is both a haunting, twisting thrill-ride through the Maine wilderness, and a story of friendship, humanity, and the will to survive. Terrifyingly real and impossible to put down." "Raw, relentless and heart-poundingly real, this book knocked me off my feet like a river in spate." "Lost in the brutal Maine wilderness, four women struggle to survive, testing the boundaries of their friendship and the limitations of their own strength and mortality. Terrifying and wholly visceral, The River at Night will leave you gasping, your heart racing, eyes peering over your shoulder to see what follows from behind. Take a deep breath before you begin because it’s the last you’ll have until you’re through." "The River at Night is a dark, twisting, unrelenting thriller that kept me frantically turning the pages well into the night. Erica Ferencik skillfully combines jolting plot twists, lyrical prose, and a beautifully brutal setting, cementing The River at Night as my favorite debut novel of the year." "Erica Ferencik's The River at Night is a high-octane debut, a thriller that combines the watery adventure of Deliverance with the twisting psychological suspense of Lisa Unger. This is a taut, tense novel that rushes like the fastest rapids. Grab a hold now and enjoy the ride!" "In the tradition of James Dickey’s Deliverance, this exciting survival tale hooks from the first page." "This novel quickly becomes a dark, more-twisted-than-the-river tale of secrets as night falls in the wilderness."